Great thinkers, revolutionary leaders, daring explorers, powerhouse politicians, clever inventors, skilled artists, sporting legends, and music icons have all changed the course of history and left their mark on the world. This exciting reference book for children shares their personal stories and showcases their achievements as never before. 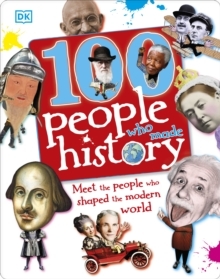 Part of DK's best-selling top 100 series, 100 People Who Made History is a who's who of the great and the good, across nations far and wide. From Marco Polo to Marie Curie and William Shakespeare to Walt Disney, history's movers and shakers are united in the pages of this landmark title. Each personal profile is defined by engaging illustrations, accessible biographies, and unexpected facts to entertain and enlighten. This roll call of famous faces will keep young readers returning to this book again and again.